Suborbital Reusable Vehicles: A 10-Year Forecast of Market Demand [10 MB PDF] This 2012 study was conducted for the FAA Office of Commercial Space Transportation and Space Florida. 102 pages. The SpaceX Falcon Heavy Booster: Why Is It Important? John K. Strickland, Jr. (NSS Board of Directors) takes us on a tour of this potentially game-changing rocket that promises a 95% reduction in launch costs compared with the Shuttle. Orbital Propellant Depots: Building the Interplanetary Highway. John K. Strickland, Jr. (NSS Board of Directors) explains why “gas stations in space” are a critical component of our entire future space exploration and development effort. Five Reasons Why the Space Age Is Just Beginning. And This Time It’s for Real. Does the end of the Space Shuttle mean the end of the space age? Howard Bloom (NSS Board of Governors) argues that the next giant leaps, propelled by private enterprise, will change the nature of resources, energy, jobs, and the economy. Space Transportation Infrastructure Supported By Propellant Depots [12 MB PDF]. David Smitherman, NASA Marshall Space Flight Center, and Gordon Wookcock, Gray Research. 30 pages including post-publication Addendum. 2011. Access to Mars [3.1 MB PDF]. Presentation by John K. Strickland, Jr., at the International Space Development Conference, Huntsville, Alabama, May 18-22, 2011. 109 pages. 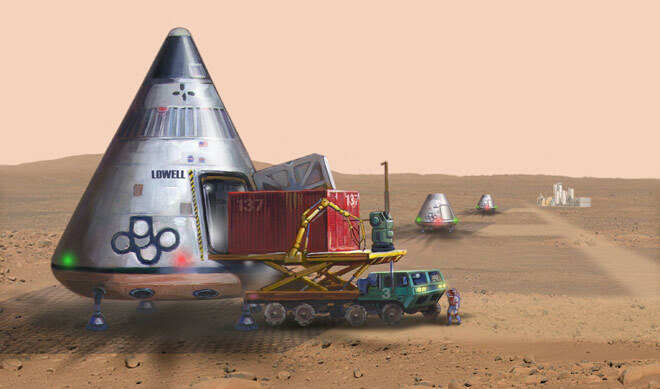 Describes a Mars transport and logistics system based on a fully re-usable Mars Ferry. SpaceX Falcon Heavy Press Conference, April 5, 2011. 38-minute video of the entire press conference where SpaceX CEO Elon Musk announces the world’s most powerful rocket. The Untold Story of the DC-X: The Spaceship that Came in From the Cold War. How to develop single-stage-to-orbit transport with aircraft-like operations with a program approach that featured a modest budget, an accelerated timetable, a small managerial team, and minimal paperwork.